The framed Katerynoslav type II Trident is attractive, not common, and much forged. The most well-known (and collectible) forgeries are the quite good ones distributed by the Constantinople dealer Samuel Guéron. 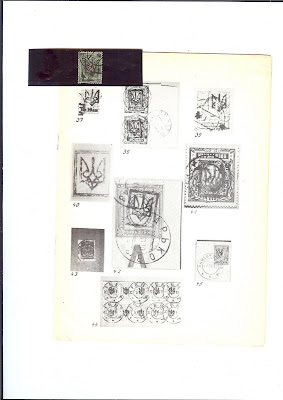 These are often found with fake KHARKIV postmarks. In the early 1990s, I walked into a stamp shop in Tunbridge Wells in England and asked for any Russian or Ukrainian material. 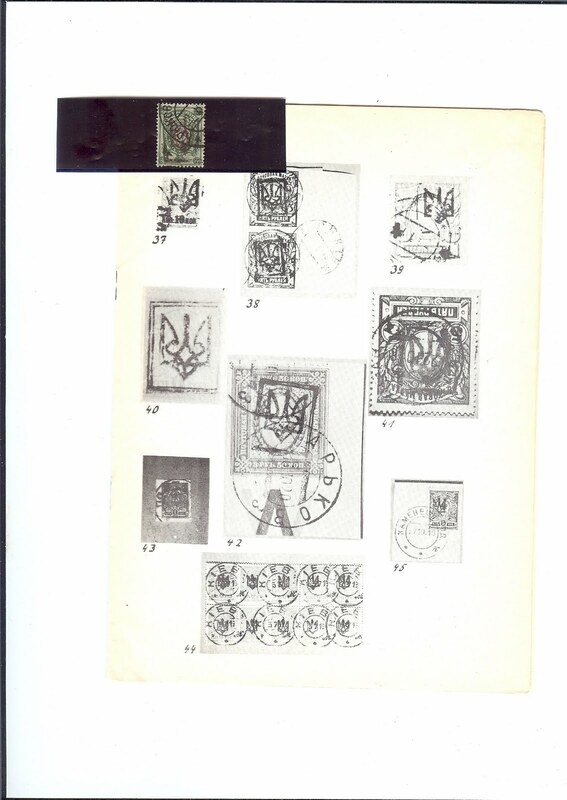 Much to my surprise, the dealer produced a very, very old stockbook stuffed with Katerynoslav Type II tridents, many on kopeck values and many on unaddressed philatelic covers. At £25 I thought I had made my fortune - but the whole lot were Guéron forgeries. I remember sending photocopies of the untouched stockbook to John Bulat before I broke it up. There is a variant of the Type II which is not well known, the so-called Haddendorf type. In his Ukraine Jekaterinoslaw Bildanhang (1956), Dr Seichter illustrates two examples (illustrations 37 and 39 - see the picture above) and labels them "Haddendorf-Type (Neudruck)= abgenutzte Type II mit fast fehlendem Rahmen". In other words, it is a Reprint with the frame lines almost missing. I have only ever seen a very few examples and at the present time I have just one in my stockbook, on a 25 kopeck stamp illustrated above. John Bulat does not mention this Reprint in his Catalog and neither does Dr Seichter in his Sonderkatalog. More puzzling, in his booklet Was wir über Jekaterinoslaw wissen (1956), published in the same year as the Bildanhang, he makes no mention of the Haddendorf type. So all we have is a name and a few examples. Information please!